Once again, Halloween has come and gone. As a youth, the season as a whole and the spooky night of ghouls and goblins in particular, was one of the best times of the year for me. These days, however, it’s my ten-year-old daughter’s candy wrappers that litter the living room floor. These Halloweens are very special to me as a father, but of the Halloweens of my youth, one in particular — 30 years ago — stands out as the best of them all. In the summer of 1986 my parents went through a divorce and my mother and I moved to a new neighborhood in Newport News, Virginia. I remember, quite clearly, unpacking, setting up my new bedroom, and getting my Apple IIe system up and running on a desk by the window. This was about the time school was starting up after the summer. I was 14 going into the eighth grade. Around this time the Apple IIgs was released, and I went to one of the launch-day dealer demos on a Saturday in September at Chaney Computers in Newport News. I saw the memorable Dealer Demo and got to play around with the unit a little. I really wanted a IIgs, and shifted into my sell-the-old-, plead-with-parents-for-the-new-system mode. As I was ramping that up, for reasons I can’t recall, I decided that I wanted an Atari ST instead, and so put the 520ST in my sights. I ran the Apple IIe in the local Daily Press‘ classified ads section and got it sold. I recall sitting in Spanish class on the day we were to go to Games ‘n’ Gadgets in the nearby Coliseum Mall to purchase the system after school. I told a classmate sitting next to me, a computer geek like myself, my plans for the afternoon and I remember him trying to convinced me to buy an IBM PCjr setup (like he had, discontinued at that point) instead. It’s odd, the little thing one remembers. At any rate, my mom took me to the mall and we came home with an Atari 520ST, an RGB monitor, and two games: Time Bandit and Major Motion. I had fun with those titles, but that’s all I had to run on it, well, aside from bundled NEOchrome (paint program) and Megaroids. I didn’t (yet) have a modem for it to dial into BBSs and hadn’t (yet) joined a local users group. So, while I consider Time Bandit to be one of the best games I’ve ever played, I was wanting a new game. 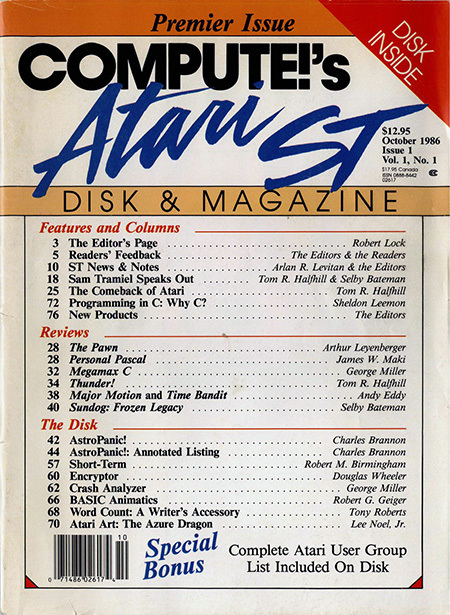 By this time I had started buying copies of the new STart magazine and Compute!’s Atari ST Disk & Magazine to fuel my ST experience. (I have quite a few STart magazines on the shelf, but no ST-specific Compute!s to speak of.) One day in early October I was flipping through the first issue of Compute!’s Atari ST [JPEGs | PDF courtesy of Atarimania] when on the back, inside cover I spotted an amazing looking game that I’d never heard of before. (The exact ad I’m speaking of, from that very issues of Compute!’s Atari ST, is shown below.) 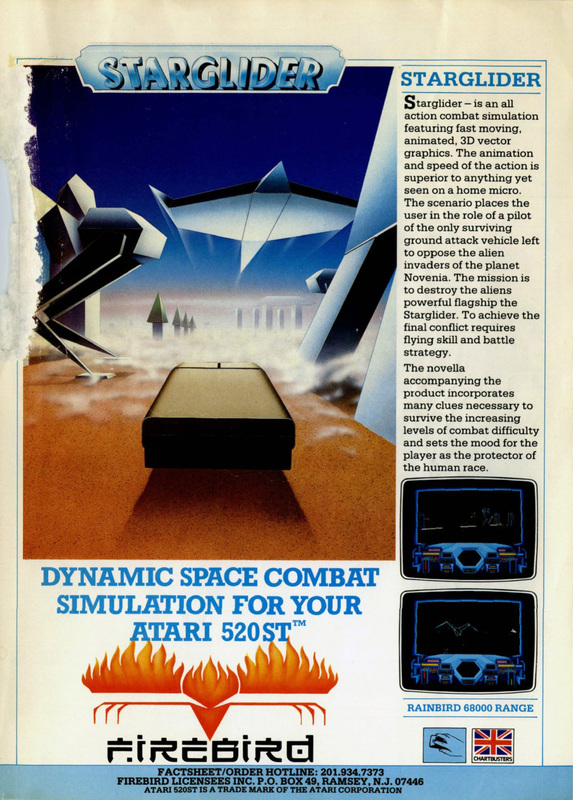 It was a 3D shooter called Starglider that looked rather like Star Wars in the arcade. The local Games ‘n’ Gadgets didn’t carry it, so I excitedly ordered it through one of the mail order houses listed in the magazine. As October rolled along, the weather got cooler, leaves began turning hues of yellow and orange, and Halloween was approaching. And I was somewhat bummed; that would be the first year I did not trick-or-treat on Halloween. I was 14, in a new neighborhood where I didn’t really know anyone, and going through that divorce had me feeling a bit less like a kid. So, I arrived home from school on Halloween (it was a Friday) in a melancholy mood when my mom told me that a package had arrived. I thought for a second and — it was Starglider! I’d ordered it weeks before, and here it was, on Halloween day. So, I ran upstairs with the package, slid open the oddly sturdy, blue, glossy cardboard box, pushed past a wall poster and an actual novella, and found the game floppy. I slid it into my SF314, booted up the machine, and was blown away by digitized audio — singing voice and instruments — on an Atari ST! (The early ST’s sound chip isn’t technically capable of that.) Once past that, I found a game that I fell instantly in love with. Starglider looks primitive by today’s standards, but it was visually amazing to me, sitting there in my room on that October evening. I was in such a good mood playing the game and seeing what my ST was capable of, that I took a break and biked around the neighborhood, watching the little ghosts and Frankensteins and Bat-Men work the houses for candy. Leaves were rustling in the wind, there was a sliver of a moon in the sky, and I felt quite content to be enjoying the scenery, if not really taking part in it as I used to. I was back in my room with Starglider and back out into the night several times as the evening wore on. It seems a trifle of a thing, but Starglider and the Atari ST had saved Halloween for me. I went to bed feeling rather blissful that night. This entry was posted in Atari, Down Memory Lane, Gaming. Bookmark the permalink. Thank you for sharing this memory and for writing in such a way that we felt like we were there with you! The power of Nostalgia and the defining times in the computer-scene that we had in that Era. Back then we knew that computers were limited but there was that potential for magic that existed that would just blow you away. I checked out a YouTube video of Starglider and my 14 year old self would be blown away too. It looks like it was made by Argonaut software, who later made Star Fox on the SNES using the SuperFX chip, so you were at the cutting edge! Sure it is. And I think that’s fine. That’s definitely part of it for me. A big part. This sure brings back great memories. I would always hit the reset at startup the hear the singing part to show off to my friends!